Hinges creaked. Maddie glanced up in time to see a bedraggled huntsman drag himself inside. He kicked the door to ensure the rubber seal took properly. Good. She didn’t want more wind-borne ash in here than was absolutely necessary. Only the newbies to Eclectia’s harsh land would leave any door or window open. She’d trained her regulars well. Maddie turned back to the open fire, fueled by scrubby brush—the only stuff that grew here. She poked at the meat stew in the cauldron, and its pungent aroma released into the room. She frowned. If only she had a potato to put in it—that would make a dish fit for a wizard. But no wizard had ever set foot in her establishment, and potatoes only grew in the underwater gardens—out of reach for any grit-breather unless he was filthy rich, but the rich folks didn’t live here. Here, they had to make do with the bitter leaves and seeds of the lavabush—both for bread and ale—and the third-grade meat plentiful in a hunting village. She ladled stew into a bowl and made her way between the tables to plunk it before the hunter. “Here you go, Jax. Good hunting today?” He stared blankly at the food for a moment, then nodded with the weariness of one who had shot a giant beetle and hauled it back to town. Maddie knew that look very well. She gave him a friendly whack on the back, waited till he let a small smile slip out, then headed back to her kitchen across the room. The earth rumbled and the building shook, its flexible mortar and light pulpblock walls absorbing the shocks. Maddie clutched at the counter to prevent herself from falling. Her guests looked up from their meals. The quake settled and the murmur of conversation started up again. Maddie bowed her head for a moment before going to pour a lavabush ale for Jax. She thought she might need one, too. Hmm, I think I've been in this joint sometime. Though, on second thought, probably not; I doubt they serve Dr Pepper. This was a great story. 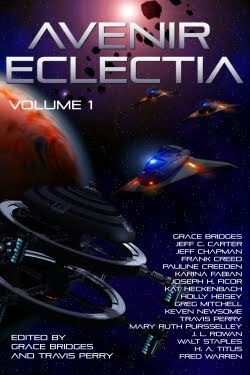 I love the look into yet another part of the Eclectia world.